The Power of Positive Praise! THE ENEMY REALLY FIGHTS US, but as long as we keep fighting, he can't win! (Sings "Keep on Believing!") At first they used to sing that "Keep on believing and pray your way through", but my Mother was a great one for praise! She said "praise your way through"!--Because that's really how you get the victory! If you believe in your prayers, you're going to start praising the Lord for the answer, even before you see it! TYL! I SAID TO MARIA, "YOU NEED TO FIGHT! And you need to praise the Lord more instead of talking about your weakness and your headaches, etc." As long as you're thinking about the Scripture and the Lord and you've got a song or a praise in your mouth, you can't complain and murmur and moan and groan and bemoan about how bad you feel! SO YOU REALLY NEED TO ATTACK THE ENEMY!--And when you get down or feel down, quote Scripture, sing a song! I said, "You just need to really go on the attack and refuse to talk about it! Praise the Lord and thank God for the health you do have! Fight the Enemy!--Really attack! "THOU SHALT KEEP HIM IN PERFECT PEACE WHOSE MIND IS STAYED ON THEE." ( Isa.26:3 ) If you keep your mind on the Lord, that keeps you from getting it on your problems and your troubles. Whatever you do, don't go around moaning and groaning and murmuring and complaining the Devil's own doubts and doctrines and lies! Don't do it, or you're just letting the Enemy in! The minute you feel like doing that, start praising the Lord, start going on the attack! Sing! Quote Scripture! Do something positive! I'VE OFTEN BEEN QUITE SICK and I DIDN'T EVEN WANT TO ADMIT IT! I don't like to give the Devil the satisfaction of hearing me talk about it! But sometimes the Lord would allow it to get bad enough that I'd have to humble myself and ask for prayer. SOMETIMES WE'RE TOO PROUD TO ASK FOR PRAYER, THAT'S ONE THING.--But when you're fighting the Enemy and you hate to admit you got sick because you just don't want to talk about it and give the Devil the satisfaction of hearing you preach it, that's another thing! I CAN REMEMBER MY FATHER WOULD HARDLY EVER ADMIT HE WAS SICK, EVEN WHEN HE WAS ALMOST DEATHLY SICK! 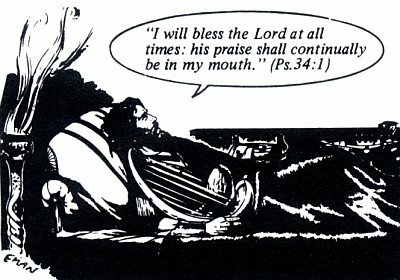 He would refuse to talk about it or even admit it and walk around with a fever, almost half-dead, praising the Lord and singing and rebuking the Devil in spite of it all! So Maria said, "Well, isn't that deceitful and not really being honest? I'm not really telling the truth if I'm going to act like I'm not sick when I am!" AND IMMEDIATELY THE STORY ABOUT ELISHA and THE SHUNAMMITE WOMAN CAME TO ME. ( 2Kg.4:8-37 ) One day her boy died of sunstroke out in the field. So immediately, by faith, his mother took him in and put him in the Prophet's room on the Prophet's bed, dead, and she ran off to Mt. Carmel, some miles away, where she found Elisha. HE GREETED HER and SAID, "IS IT WELL WITH THEE?" SHE SAID, "IT IS WELL." He said, "Is it well with the boy?" She said, "It is well." Was she lying?--She had such faith that even though the boy was dead, she had the faith that he was in God's hands and it was well with him! (Maria: And then she still went ahead and asked for prayer.) Yes, she went ahead then and told him what had happened and asked the Prophet to come and pray for him. IT'S NOT THAT HE WANTS YOU TO HIDE THE FACT THAT YOU'RE SICK. You should humble yourself and not be so proud that you're ashamed to admit that you're sick. But you don't have to go around all the time complaining and murmuring and groaning and moaning about it either!--That's not faith. You can admit it and ask for prayer, but then try to be cheerful, encouraging, and show you have faith!--Sing, quote Scripture, be positive and praise the Lord! BUT IF YOU JUST ACCEPT IT, THAT'S BAD. And if you admit it, that's even worse!--Because then you're testifying to the Devil's handiwork. I'm not talking about when you admit it once and ask for prayer, but when you keep on going around groaning and moaning and sighing and always complaining and murmuring. "MANY ARE THE AFFLICTIONS OF THE RIGHTEOUS" ( Ps.34:19 )--BUT MOST OF THEM ARE VERY LITTLE ONES, TYL, and very minor and just enough to keep us close to the Lord and praying and trusting and praising the Lord and asking the Lord for help so we don't stray too far away. David said, "Before I was afflicted I went astray, but in my affliction I cried unto the Lord!" ( Ps.119:67 , 146 ) That's probably why he says "many are the afflictions of the righteous"--that's what keeps them so righteous, their many afflictions! WELL, WHEN YOU SEEM TO BE EXCESSIVELY TIRED and HAVE FREQUENT HEADACHES, IT'S NATURAL TO WONDER WHY YOU'RE FEELING BAD. Well, I think we know now, so now you can go on the attack and resist the Enemy, because it's the Devil fighting you! I don't think it's necessarily the Lord punishing her for anything, except it does say a lot about chastening in that passage we got, Hebrews 12. That word literally means "child training". SO MAYBE IT'S ANOTHER LESSON THAT WE'RE HAVING TO LEARN THROUGH A LITTLE CHILD-TRAINING, through a little suffering, a little affliction. I think dear Maria is learning her lesson and I don't think I've heard a complaint out of her about her health! (Maria: I feel a lot better, TTL!) PTL! If the Devil can't get you to preach defeat, then he gives up! AMEN! TYL! PYJ! REBUKE THE ENEMY IN JESUS' NAME! Deliver us all out of the hands of the Evil One! Protect and keep us, Lord, and we thank Thee for Thy Angels around our beds and around our heads and around us all day long! TYJ! Thank You, Lord, for how wonderfully You've kept us and protected us and provided for us! Help us to thank You for it continually, all day long! Thy Spirit dwells in the praises of Thy people, Lord! ( Ps.22:3. ) TYL! YOU SAID TO COME INTO THY GATES WITH THANKSGIVING, and INTO THY COURTS WITH PRAISE! ( Ps.100:4. ) "In everything give thanks!" ( 1Th.5:18. ) Lord, help us not to forget to be thankful continually, constantly praising Thee and quoting Thy Word to encourage our faith, Lord, and singing positive songs of praise to rebuke the Enemy! THE ENEMY HATES PRAISE, LORD! HE HATES SONGS THAT PRAISE THEE and HE HATES THY WORD MOST OF ALL! So keep us full of it, Lord, in Jesus' name we ask for Thy glory!--Amen?